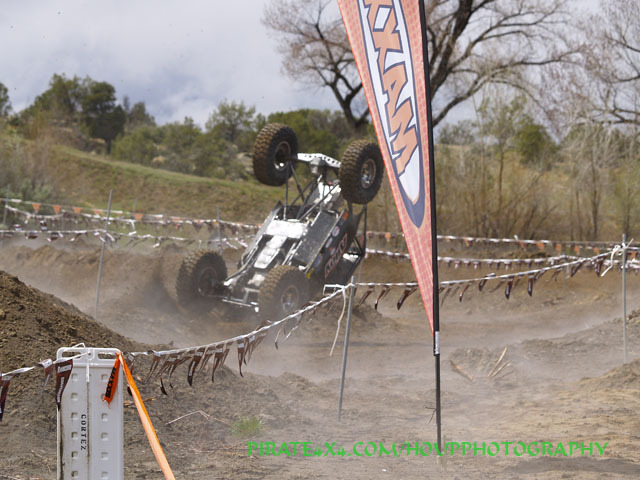 XRRA Western Division Round #2, Cortez, CO. 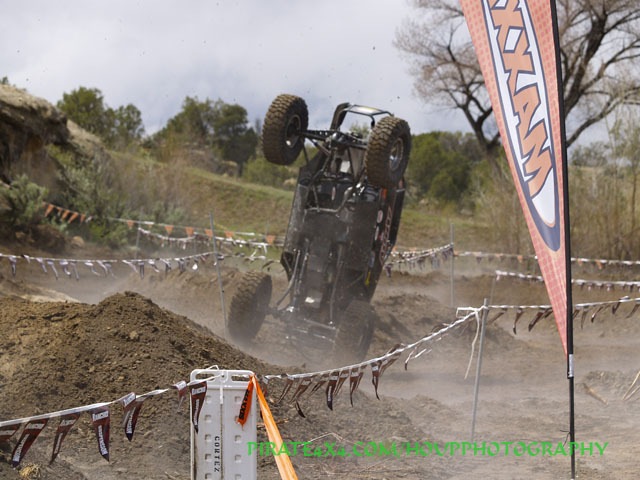 The forecast called for rain on race day, but the rock racing teams showed up in force for round two of the Western XRRA Rock Racing series in Cortez, CO. Tech inspection was hosted by Randy & Cottin Rodd at Jimmy’s Outback 4x4. Before the banners were even in place, the track had already claimed its first rig. Creighton “Hot Rod” King was jumping his scooter in lane two as people antagonized King to jump higher and hit the jump faster. Unfortunately the intake manifold was no match for the XRRA course as Hot Rod ripped the carburetor off, and the scooter was retired for the weekend. The Maxxis guy Creighton King rallies his scooter before the competition. 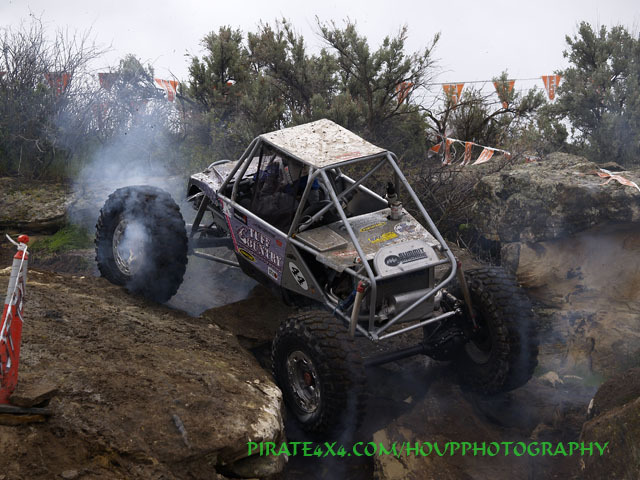 It was almost a typical XRRA race morning in Cortez as the teams and media drove into the comp site dodging race fans... Except for one little detail, it was SNOWING!! It would continue to snow off and on through the day, but that did not deter the locals from coming out and cheering the drivers on as they battled the elements. With the cold wet snow coming down, it was rather amusing watching the various media groups concocting some type of water proof system for their gear. It was actually fun to watch and see who came up with cool ideas, water proofing material ranged from a freezer bag to a hacked up rain poncho and tape. Kudos to everyone for sticking it out! Ride Motorsports members Lydia and Brooke would not be racing due to a failed flex plate. Just before the event started, the RIDE Motorsports team had no choice but to drop out of the event. They had spent countless hours prepping the rig for this event, but a bad flex plate and/or starter shattered Brooke & Lydia’s hopes of competing. The beautiful duo would have to sit out yet another XRRA race. 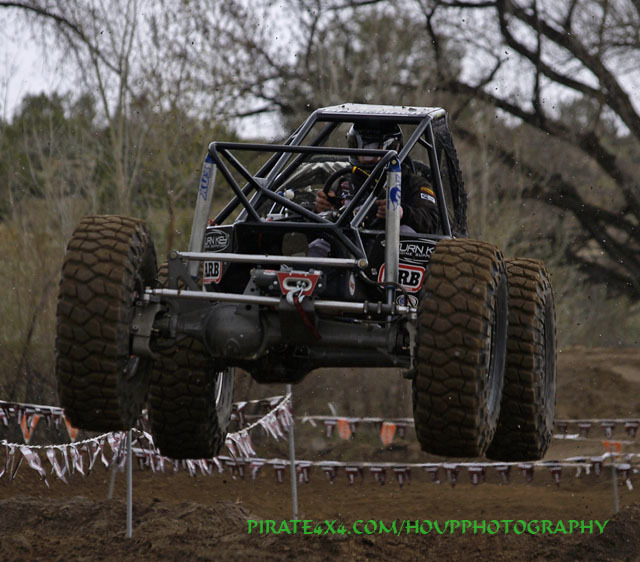 Tracy Jordan breaking in the new Spidertrax Cruiser. It didn’t take long for the carnage to begin when Tracy Jordan showed the fans a huge cloud of white smoke, as a result of blowing the ball check in the steering system from to much pressure. Tracy decided to call it a day after a cool excursion down the rock face on the side of the SPIDERTRAX off-road machine. Munson's Rod Shop was the second team of the day to have steering issues as he blew the seals out of his power steering pump on his first run of the day. The team managed to fix the problem to compete for the rest of the day with no mechanical failure and just a “banner” issue. The Munson Rod Shop rig veered off into the banners on their 3rd run of the day on lane two of the reverse course, which was possibly the toughest course/lane of the day. Snow made the rocks almost impossible to climb on this course! Jeff Mello decided to celebrate his birthday in style on Saturday by rolling multiple times and breaking plenty of parts. Although I don’t think I have ever seen an aging man smile as much as Jeff did that day! After Jeff rolled in the very first turn of his first attempt of lane two, he looked at his good friend R.J. “The Fireman” Brown and said, “TOP THAT”! Brown, the man that takes the phrase, “don’t get it twisted” as a challenge, did actually go out and do as Mello asked; he topped him. Brown made quick work of the double jumps through the snow and made it up and back down the face of the rocks, just not on all four wheels. The frigid temperatures and blizzard-like snow would not stop R.J. from earning the name “Fireman” or catching his rig on fire…..again! I can’t help but wonder if his new truck will have an NHRA inspired fire system, at least we know the fire suits work. 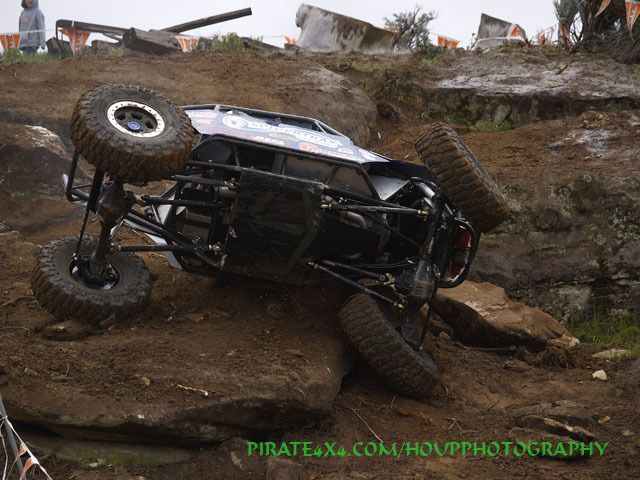 Lovell takes a tumble in the Alloy USA Ranger. Randy & Cottin Rodd had a stroke of bad luck on course two. 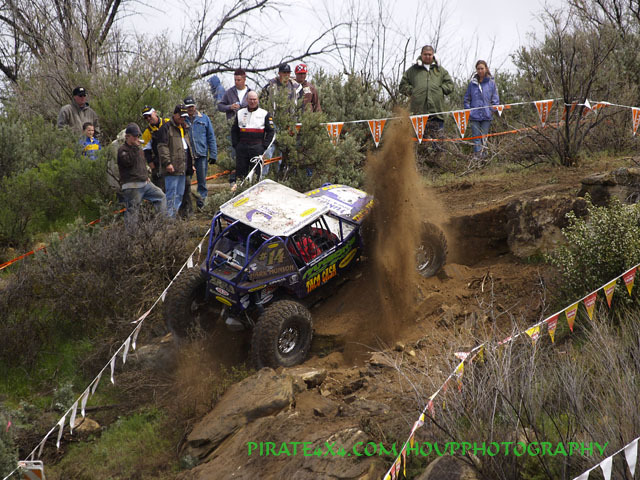 The Jimmy’s Outback 4X4 sponsored rig was 4th fastest on course two until they were disqualified for hitting a banner. On their fourth course of the day Cottin broke a u-joint on the snowy rock face that claimed many competitors. Campbell took a nasty tumble this weekend. 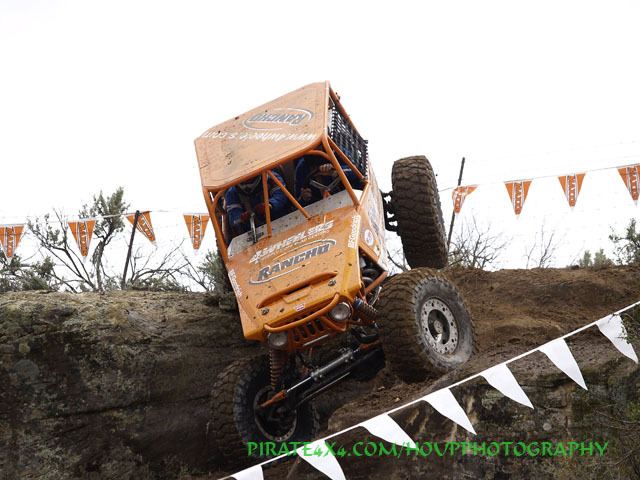 The Screamin’ Weasel race team was back in action after the third place finish in Moab with Shane Chiddix in the driver seat. On Chiddix’s second run of the day, he broke the steering ram on the exit of turn two and still launched the Screamin’ Weasel rig over the doubles. Chiddix did what he could to stay in the competition but came up short. 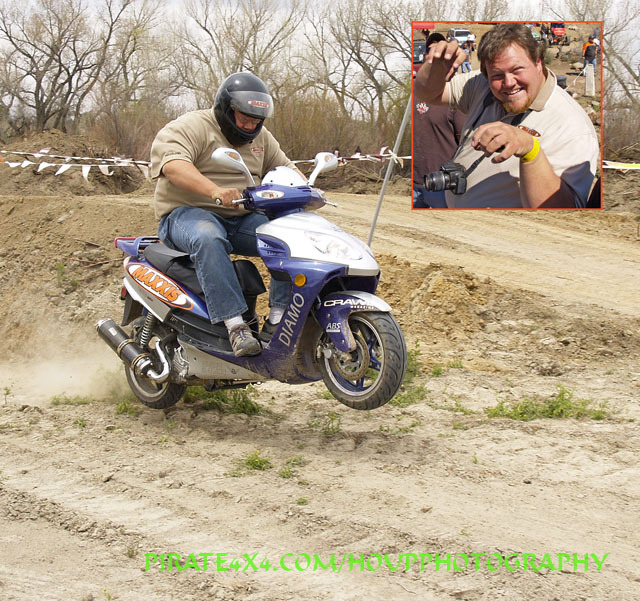 XRRA recognized Shane’s efforts and he received the "RANCHO Alter Ego Award". Rob Bonney took the well deserved win with awesome driving. 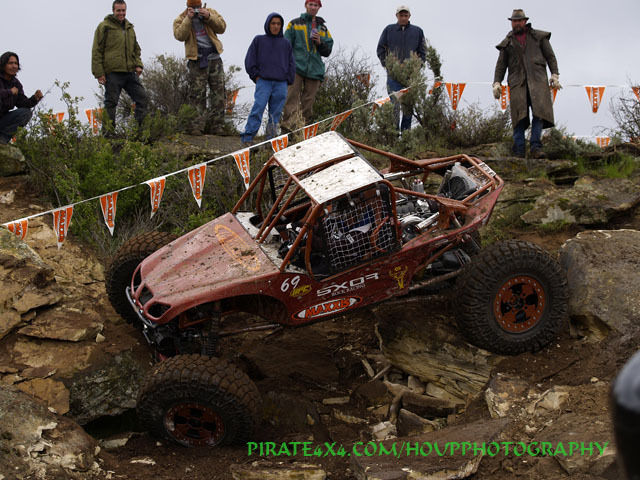 Since we are on the subject of awards, it was no surprise to me that Rob Bonney walked away with the first place finish. I remember thinking as he and his team chased me down on the fun drive to Cortez at a very good pace, that this guy was nuts! I told Rob and his spotter Dan, not to drive it like he stole it… Drive it like he trailered it! He did just that and took the first place win with a total time of 4.16. Nate Williams lightin em up! Thinking back about the event, it wasn’t about horsepower, suspension travel or financial backing. It was actually quite simple; be smooth and keep your rig together. The teams that did the best job of doing exactly that are listed above. I would like to thank all of the teams for sticking in there with the “4 seasons” weather conditions we encountered and making this yet another great event. Again, thank you to the Weaver’s and the entire XRRA staff for a very well run and organized event, the medical staff was tested this weekend and did an outstanding job when they were called into duty. 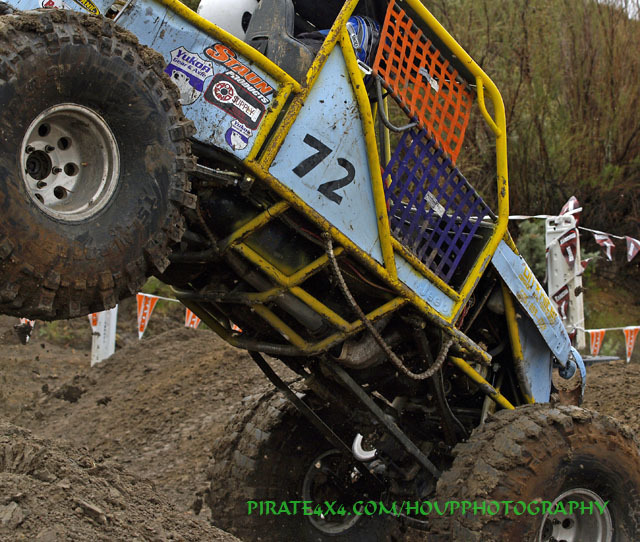 Myself and the entire Pirate4x4 staff would like to wish Brandon of Team SXOR a speedy recovery and best wishes! We will see you again in a few weeks for round three of the XRRA Western series in Colorado Springs. Until then, be safe!